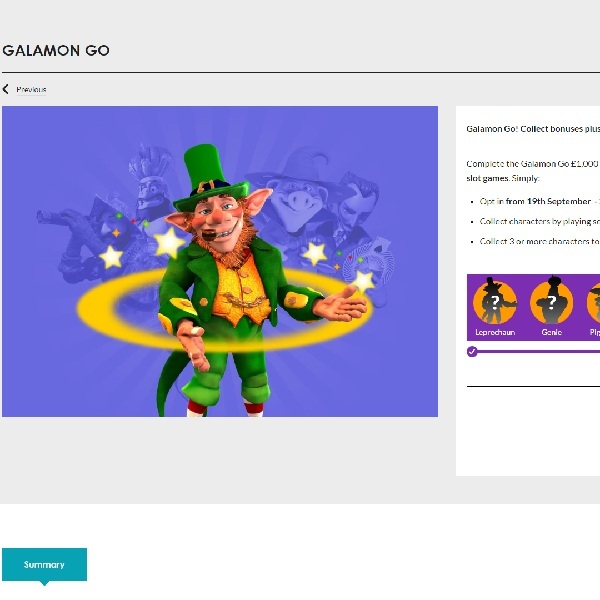 Gala Casino has launched its Galamon Go challenge and it is giving you the chance to win a share of £1,000 and receive casino bonuses. The idea is to collect characters from various different games at the casino. Once you’ve collected three characters you will definitely receive a bonus and there are a total of five available to collect. The Leprechaun is available from Rainbow Riches Pick n Mix, the Genie is available in Genie Jackpots, the Pig can be found in Pig Wizard or Wish Upon a Jackpot, the Sailor is floating around Cashtro’s Voyage and the Magician is hiding in Magician Trick Picks. If you collect 3 you’ll get a £20 bonus, collect 4 for a £30 bonus and collect 5 for a £40 bonus. Furthermore, five qualifying players will be chosen at random to win £200 cash.